Welcome to Day Two of The Escapist's Indie Developer Showcase, a 10-day celebration of the designers and programmers who have struck out on their own to make the games they want to make. Each day we'll feature a new game or demo by an up-and-coming indie developer along with a brief interview. Some games are already commercially available, some are works in progress, but all are free to play. To see who's on the schedule or check out what you've missed, click here. Enjoy! Adam Saltsman is Adam Atomic, a programmer, entrepreneur, indie game developer (making games for the web and the iPhone), and active member of the TIGSource indie games community. His latest project is Gravity Hook, a simple flash-based endurance game where you travel up an endless, explosive-filled mining shaft using only your opposable claw. "Gravity Hook is based on a prototype made by Niklas Jansson (a.k.a. Arne, a.k.a. Prometheus) called Gravity Key. However, it wasn't very accessible, and Niklas has a kind of bad habit of never finishing anything he starts anyways! But his core risk/reward mechanic of having to sort of let go at the last minute was really, really fun. I asked Niklas if I could try making a kind of clicky, mouse-based infinite-climb version of that, and he agreed. 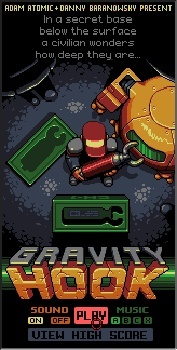 "Gravity Hook follows behind two other flash game attempts (Nano and an unreleased sniper game) that I never really finished, so I had a pretty clear mental picture by about halfway through development of exactly what was going to go into this game, and what wasn't. It was a very short list!" "The most tedious thing is the larger pieces of artwork that go into each game, mainly environments and title screens. There is definitely a reason that so many indie games have such minimalist title screens! The most rewarding thing is listening to people talk about the game." "I don't know if I'm really qualified to comment on it, but I think the industry has a lot of envy for other existing industries, like film, music and computer software, but at the same time they ignore many of the best practices and policies that these industries have developed. They ignore a lot of successful software development stuff, ignore the alternate funding models of the film industry and haven't yet intentionally encouraged the underground/independent scene in the way the film and music industries have, which is where they harvest their new talent. Coupled with the fact that this is an art form unlike any other, I think the challenge is how do we nurture the art form in the long term and learn from these sister industries rather than trying to mimic their awards shows and marketing schemes? But then, that might not yield positive Q1 results for the stockholders ..."
"Stop trying to dream up Game Boy games and make something already. And for your sake, make it something small. Also, never work retail, and never take a game development job from someone who used to manufacture tires for a living."